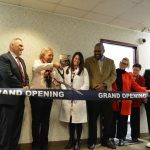 ERIE – Erie Homes for Children and Adults (EHCA) today welcomed PDC Pharmacy to its new location in the Professional Building, 1611 Peach Street, during a ribbon-cutting ceremony attended by business and community leaders. EHCA, an Erie-based organization dedicated to assisting people with disabilities to live rich and fulfilling lives, has been a long-standing recipient of services from PDC Pharmacy. PDC Pharmacy is a licensed, closed-door pharmacy, specializing in serving individuals with intellectual disabilities and behavioral health needs. PDC Pharmacy is a member of Passavant Memorial Homes Family of Services (PMHFOS), which also includes Passavant Memorial Homes, Accessible Dental Services, Life Enrichment Trust, and Passavant Memorial Homes Foundation. PMHFOS currently serves more than 10,000 individuals and continuously strives to empower those with intellectual disabilities, autism, and behavioral health needs to live successfully in the community. PDC Pharmacy – Erie will be PDC Pharmacy’s fourth location, complementing its existing sites in Pittsburgh and Philadelphia, Pennsylvania, and Boulder, Colorado. PDC Pharmacy has been serving the Erie region from its Pittsburgh location for nearly 20 years, and this investment will enable PMHFOS to further enhance the services available to those in the local Erie community. EHCA continuously strives to enhance the local Erie region and identified the need for specialized pharmaceutical services directly embedded in the Erie community. “We recognized that a local licensed, closed-door pharmacy would enhance the experience of residents in the Erie region that utilize closed-door pharmacy services and would lead to efficiencies through shorter pharmaceutical delivery routes, foster community involvement, and provide for local job creation,” said Bev Keep, chief operational officer at EHCA. For more information, visit www.ehca.org or www.pdcpharmacy.com.